Keeping track with latest market development, we are devotedly engaged in manufacturing a wide assortment of Barrier Screw. K.S. MACHINE TECHNIKS PVT. LTD.
Our Company is engaged in offering a wide range of Barrier Screws, which is manufactured using high grade of material ensuring long working life with high efficiency . The screws manufactured by us provides homogeneous mixing of the material and the groove design of the barrel gives high output in the production. 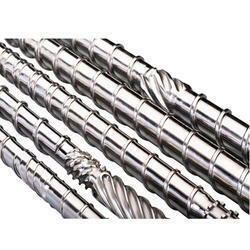 Being one of the reputed organizations in the market, we are engaged in manufacturing, exporting and supplying Barrier Screw. Diameter: 45 to 200 mm. We have in store, an assortment of Barrier Screws that are broadly used as spare as well as essential components. These are applied in film plants and in injection moulding machines. The quality screws help in increasing the total productivity of plastic since these are made out of EN4IB nitro-alloy steel. Moreover, for our valued clients, these can be purchased at market leading prices. We are offering Maddoc Barrier Screw to our client. Our range of Barrier Screw comes in different diameters and lengths and can also be manufactured for customized configurations and sizes provided by our clients.